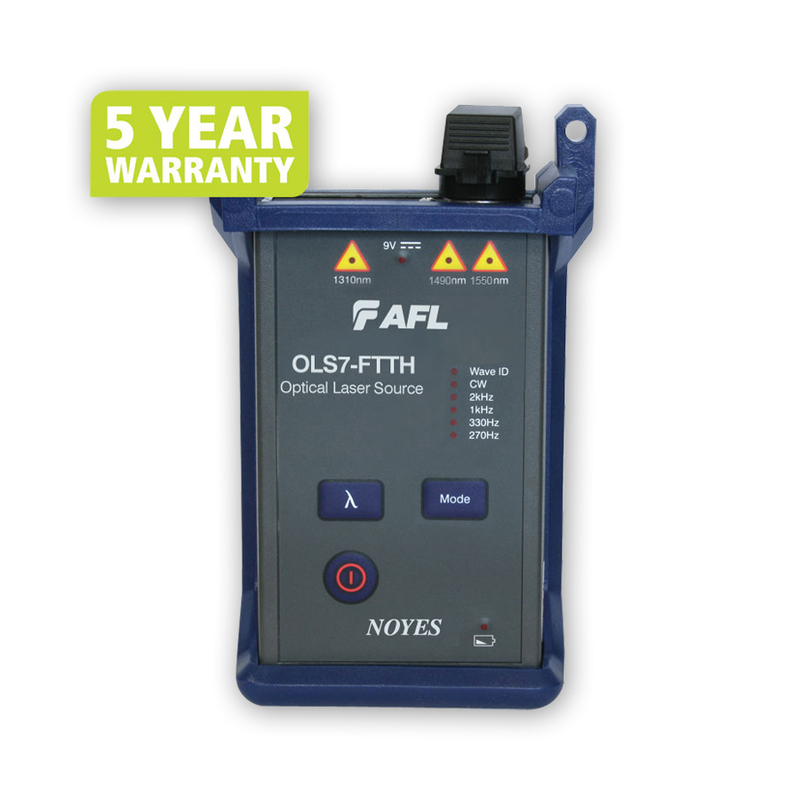 NOYES OLS7 Triple Wavelength Laser Sources are hand-held, rugged laser sources designed for performing insertion loss measurements on single-mode fiber optic links when used with an optical power meter. When paired with an optical fiber identifier (OFI-200D), both models may be used for fiber identification. The LASER output is stabilized to ensure accurate test results per current TIA/EIA and ISO standards requirements. Faster Test Times with WaveID and Multiple Wavelengths – In WaveID mode, the NOYES OLS7 encodes each wavelength with a unique WaveID code. When used with a NOYES OPM, the pair can send and receive two or three wavelengths each test – doubling or tripling testing efficiency – vastly reducing test time! Flexible Output Connector Adapter Design – Output ports on all OLS7 models feature UCI based removable adapters to allow in field removal of output connectors for inspection and cleaning of launch ferrule end-face. Removalble adapters also facilitate simple field changing of launch fiber connector between FC, SC, ST, and LC connector adapters providing access to common connectors used in today's networks. The OLS7 is fully N.I.S.T. traceable.